A holiday business in Cumbria is crediting the arrival of more reliable, ultrafast broadband for bringing their business into the 21st century. Rutter Falls Self Catering Holiday Cottages, set in the heart of Cumbria’s Eden Valley, benefits from some of the fastest and most resilient broadband speeds in the country, thanks to Cumbria County Council’s successful multi-million pound Connecting Cumbria partnership with BT. Since the future-proof technology was made available two years ago, it’s helped them run their business more efficiently, and also offer ultrafast broadband to their guests, who are attracted to the local area due to fabulous walks, wildlife and outdoor activities. 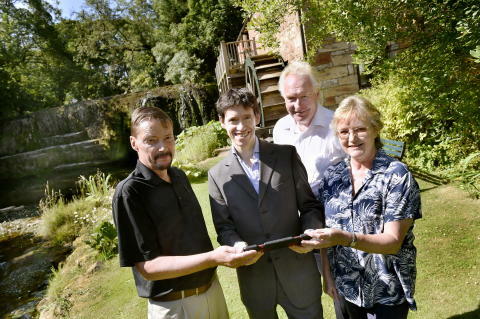 Owners Jim and Jane Wilson recently welcomed Penrith and the Border MP Rory Stewart to their business, near the village of Great Asby, so he could see for himself the benefits of being connected to Openreach’s Full Fibre network. Jane said: “It was great to spend time with our local MP who I know holds a keen interest in the rollout of faster broadband across the constituency. We’ve not looked back since being connected to the ultrafast network.We can now update our website ourselves, have reliable wi-fi mobile calling, and we manage all of our business banking and finance online, something that’s essential now there are no banks left in nearby Appleby. Rutter Falls, two holiday cottages set in a picturesque nature reserve, benefits from ultrafast speeds (up to 330Mbps), thanks to Openreach’s Full Fibre network. With such fast speeds available, people staying there will typically be able to download a 45 minute HD TV show in less than 15 seconds, compared to around three minutes on a superfast broadband connection. Or a two-hour HD movie in 90 seconds, compared to 30 minutes. Rory Stewart, himself a keen hiker and author of several walking books, said: “Fast and reliable broadband is vital for our rural areas; our small businesses depend upon it and our communities need it. It was a very great pleasure to spend time at Rutter Falls Holiday Cottages and I was fascinated to hear about how Jim and Jane are making the most of their ultrafast broadband connection. More than 127,000 homes and businesses have already benefitted from the Connecting Cumbria partnership since it was launched in 2013. The programme aims to make superfast broadband available to 95 per cent of homes and businesses in Cumbria by the end of 2019 and continues to seek further funding to provide services to the last 5 per cent. So far, almost 93 per cent of premises are already covered. Earlier this year it was announced that around 240 new trainee engineers are being recruited by Openreach to work on ultrafast broadband across the North West. Any company can access our products under the same prices, terms and conditions.